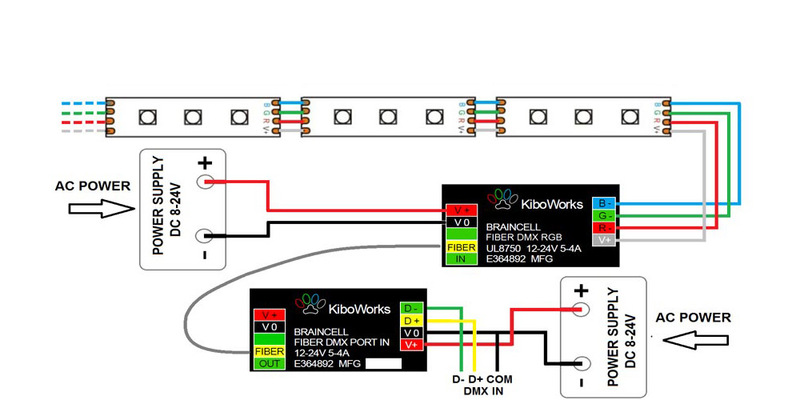 PWM Dimmer for DMX | 0-10V | Fiber LED Luminaire Control. The Briancell come in a range of configuration: DMX TO RGB | DMX FIBER SLAVE TO RGB | 0-10V TO MIXER AND DIMMER | DMX TO DMX FIBER MASTER | 0-10V TO DMX MIXER AND DIMMER. 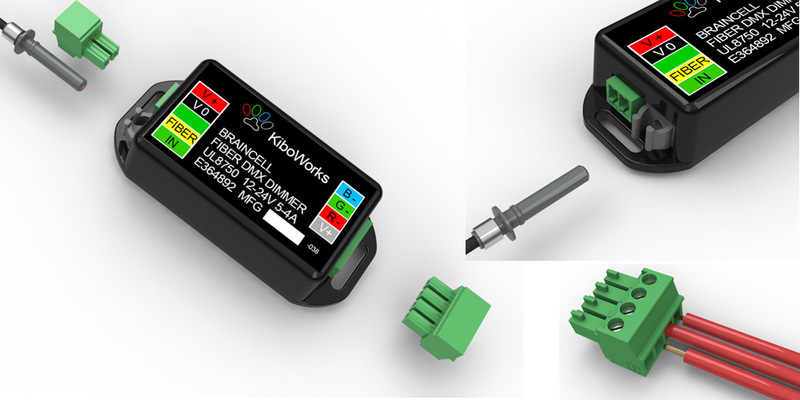 KiboWorks braincell has been designed for both architectural and entertainment lighting applications, in theatrical installations the BrainCell uses Gamma dimming to ensure the LED product can display the full spectrum of color without any sudden jump in brightness from 0 to the value of 1, ideal for stage lighting which must transition from darkness to a hint of color, unlike traditional dimmers..
Advanced features include special built in effects selected by a button. 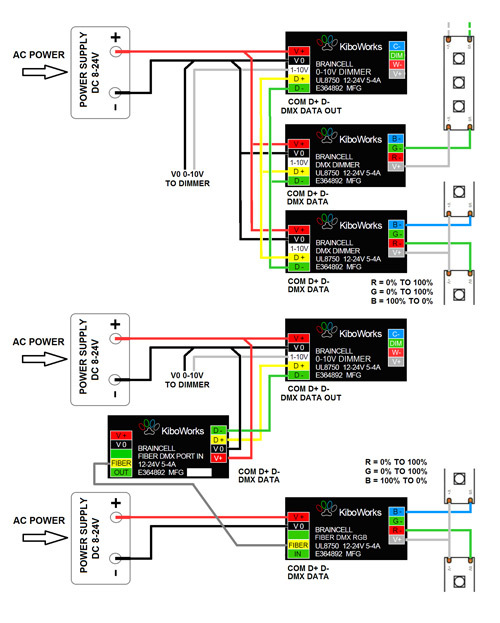 The 0-10V signal dimming is linear on all three outputs, giving ultra-smooth dimming down to 0.1%. In addition one output is inverted to support warm cool white light mixing with a single 0-10V slider giving smooth transitional dimming for tunable white with a single wall slider. 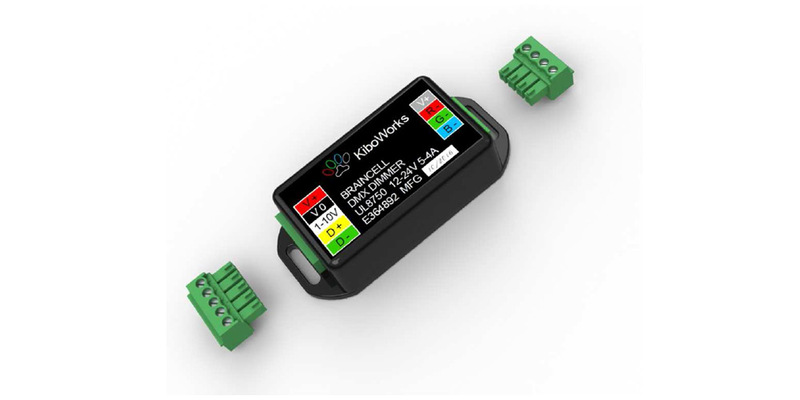 The onboard push button switch makes addressing quick and simple for anyone to program, simply send white on the DMX address or channel you wish the unit to adopt, it will assume that address from the master. It's small size allows for easy placement into junction boxes or simply tuck out of view and pluggable terminal blocks eliminate specialized tools or connectors. 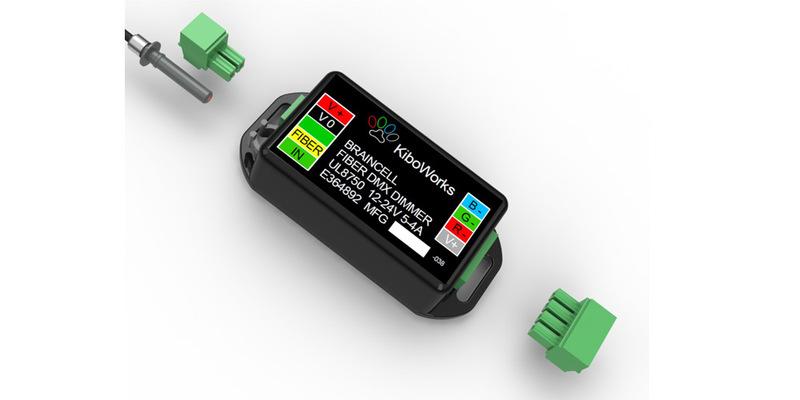 The Braincell PWM Led dimmer is compatible with virtually all 12-24V RGB LED tapes, LED strips and fixtures.